The aim of this two-year project is to implement recommendations from gender audits in organizations that have already been a part of gender audit. The intention is to improve the use of gender equality among project partners, which are 5 small enterprises from the Zlín, South Moravian and Moravian-Silesian regions. The aim of the project is to show an attractive and effective way of teaching science. The project will create a model which will give opportunity for teaching science subjects ( physics, biology, chemistry, geology, enviromental and others like astrology) in an attractive and effective way. Dyslexia is a lifelong condition and affects 1 in 10 persons in Europe. Most people reduce dyslexia to just a reading and writing difficulty. But dyslexia is a multi-faceted problem that effects not only literacy acquisition. 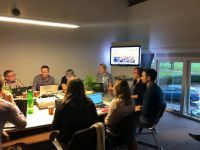 From 29th October to 2nd November 2018, a training course for teachers took place at the beautiful office of Foundation Knowledge centre PRO WORK next to Grand hotel ter Duin in Burgh-Haamstede (The Netherlands). ARTIFEX is an ERASMUS+ project focused on STEM education, i.e. education in the fields of Science, Technology, Engineering and Mathematics. ARTIFEX project is supporting European cooperation in the area of enhancing teachers´competencies in STEM education and using innovative out-of-school learning environments such as digital workshops (FabLabs) with access to high technology.